We’ve had a make over!! Foxy Feet our super excited to introduce clothing within our range of shoes. We’ve got some super brands like Lilly & Me, Numph, Studio, Sugarhill Brighton and Starfish Dubai. Drop in and try on. You’ll be sure to love it as much as we do! Our fabulous Moda in Pelle trainers are ​back in! New through the door from Caprice are these gorgeous easy wear spring casual shoes in a variety of colours. Flexible, comfortable and stylish. foxy feet are open for business as usual! barg in the last of our sale! Grab a bargain in the last of the Foxy Feet Winter Sale! AWESOME AW18 stock now arriving! The Summer 18' Sale is now fully underway with many bargsins to be had. Be sure not to miss out! Back in stock - the fabulous Salt water sandals. Stylish, comfortable and 100% water proof! Great for the trip to the beach! Join in to win a pair of spring/summer 2018 shoes or sandals! Back in stock for its 3rd season for Foxy Feet are the fabulous FitFlop! TIME TO SWING INTO SPRING! NEW AUTUMN 2017 WINDOW DISPLAY. 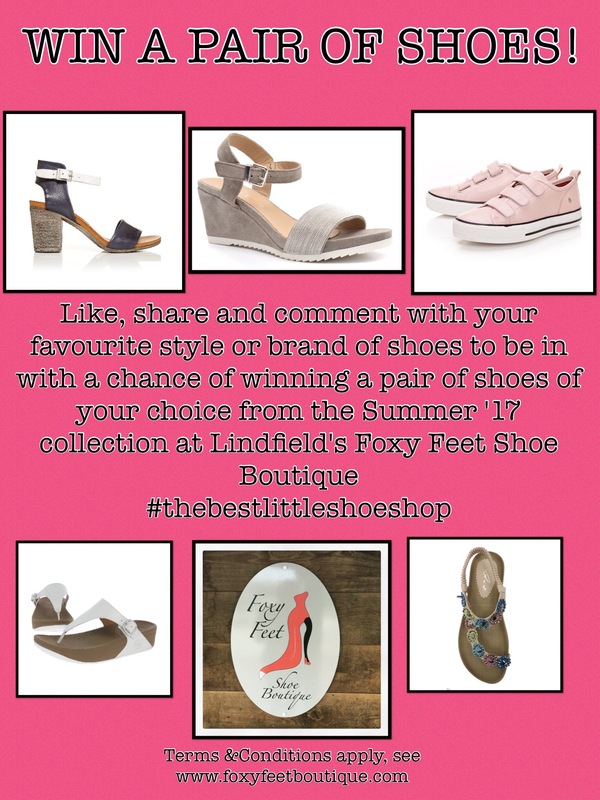 It's Facebook Competition Time at Lindfield's Foxy Feet Shoe Boutique! Spring Summer 2017 Preview Evening!